While preparing the Spalding’s Guides for reprinting, I noticed ads for Pop Warner’s book in the backs of several of them. On closer inspection, I noticed that they changed a bit from year to year. Today, I will discuss these ads in sequence from when they first appeared to when they disappeared and conjecture why the ads no longer ran. The ad goes on to describe how Warner’s correspondence was organized as a set of pamphlets or letters on a number of subjects. 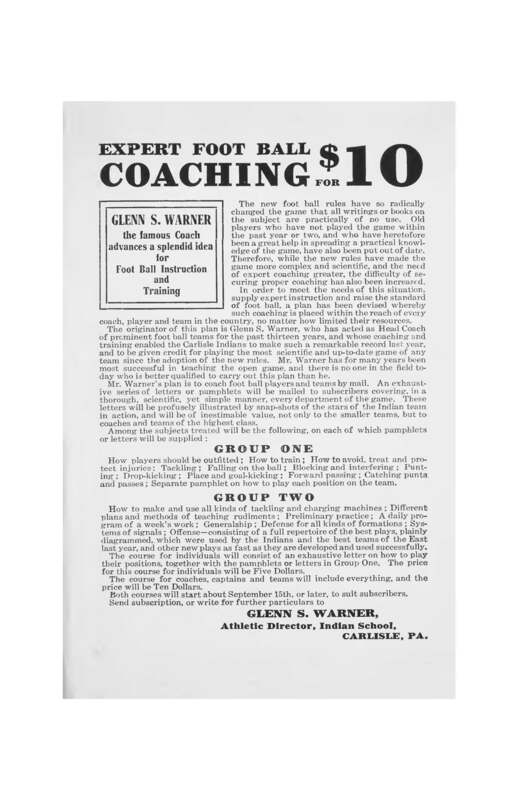 The first group of subjects were aimed at teaching players how to best play the game and were sold or $5 as Group One. The pamphlets covering equipment, strategies, signals, formations and plays among other things comprise Group Two. Coaches, captains and teams would buy the entire course, including both groups, for $10. Warner promised to start sending the pamphlets around September 15, the traditional start of practice at that time. This entry was posted on March 14, 2012 at 5:43 pm and is filed under Carlisle Indian School, Football, Pop Warner, Publishing. You can follow any responses to this entry through the RSS 2.0 feed. You can leave a response, or trackback from your own site. a new post has been made. I have subscribed to your RSS feed which must do the trick! If subscribing doesn’t do the trick, let me know.